Software giant IGT has hit the jackpot with this highly detailed and exhilarating slot based around the mysterious world of Anicent Egypt. 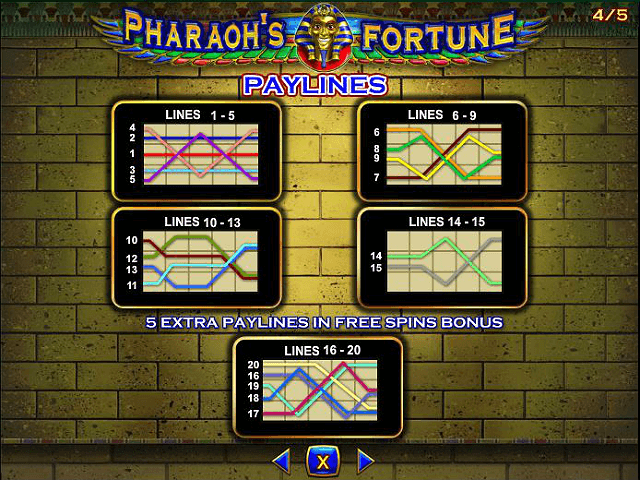 Pharaoh’s Fortune slot game boasts five reels spread over 15 paylines, with the stone tablets that make up the reels depicting the gods and rulers of the pyramids. With enticing gameplay and the chance to win up to 10,000x your bet, it's fast becoming a classic. Follow this Pharaoh’s Fortune guide to decipher the hieroglyphs and become a regular tomb raider. Play Pharaoh's Fortune for Real Money! Millions of visitors still flock to Egypt to see the ruins of the once great Egyptian empire. Now you can delve inside the tombs and temples in search of the Pharaoh’s Fortune. The game forgoes an Indiana Jones-esque story in favour of full-on classic slot machine fun, with bright and colourful symbols spinning on a golden brick background. The detail within the game is a credit to the research carried out by software provider IGT, with ancient symbols like the Eye of Ra (yes, the one from Riches of Ra) or the canine representing Anubis beautifully illustrated as if painted on papyrus. The game fuses this attention to detail with a playful feel, with each spin of the wheel playing out musical chords from The Bangles hit Walk Like an Egyptian. 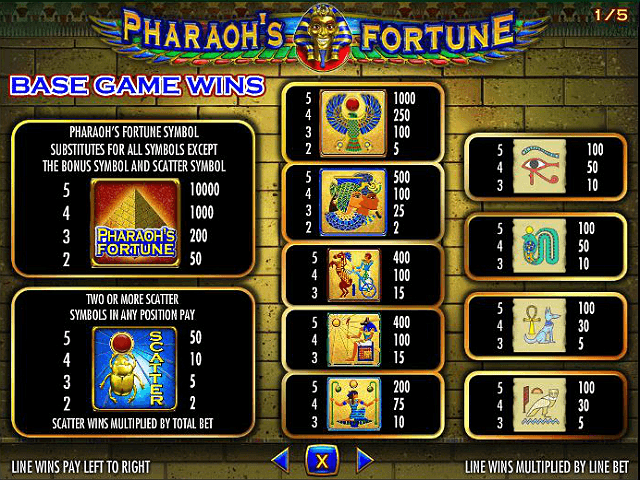 Pharaoh’s Fortune slot game features a number of symbols plucked from the history books. The lower paying ones are illustrations of the gods on parchment, while the higher paying icons show the pharaohs and queens of Egypt carved in stone. All the lower icons pay a maximum of 100 times the initial wager for a full payline, while the stone tablets increase your win up to 200 times the bet. The highest paying symbol is that of Horus, with the bright falcon's wings spread around the red circle of the sun, paying out 1000 times the bet for five icons on one payline. 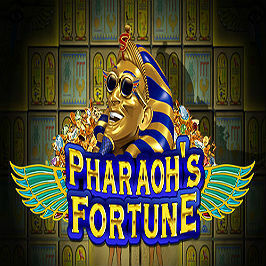 The game’s logo is the Wild symbol during normal gameplay, but this is replaced by a red striped pharaoh head during the free spins mode. The Wild can be substituted for any other block in the game, with the exception of the Scatter symbol. In the base game, the Scatter is symbolised by the much-worshipped scarab beetle, while in the free spins mode it changes to a full sphinx statue. 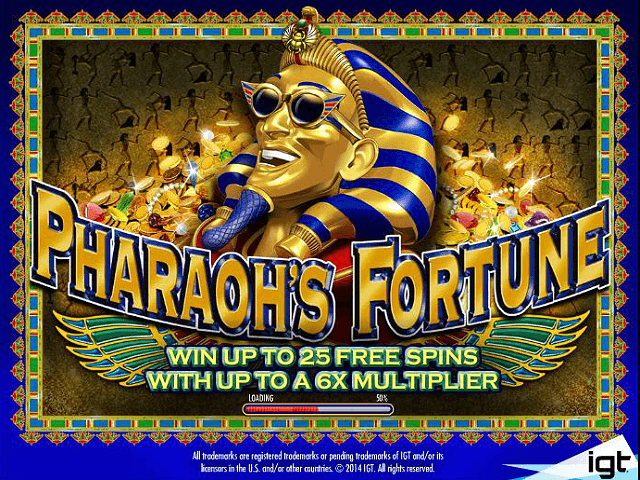 Three is the magic number when it comes to triggering the Pharaoh’s Fortune free spins bonus round. To activate it, you have to unearth three of the green Pharaoh bonus symbols on the same payline. Once it starts, you're gifted with three free spins and a 1x multiplier. You then select the stone blocks of the pyramid to reveal additional bonuses, including more free spins and higher multipliers. The maximum you can win is 25 free spins with a 6x multiplier. More free spins can also be won by landing three of the bonus symbols in any position on the first three reels. Each free spin is worth its weight in gold, paying out no less than three times the multiplier times the initial wager. The icons also change for the free spins bonus, with the lower paying icons all depicting The Bangles' famous dance moves. As mentioned, both the Scatter and Wild change, with the red striped pharaoh heads worth 10,000 times the bet if you're lucky enough to fill a payline with them. Ready to walk like an Egyptian? Ante-up with Pharoah's Fortune today. Share this Pharaoh's Fortune Review today! 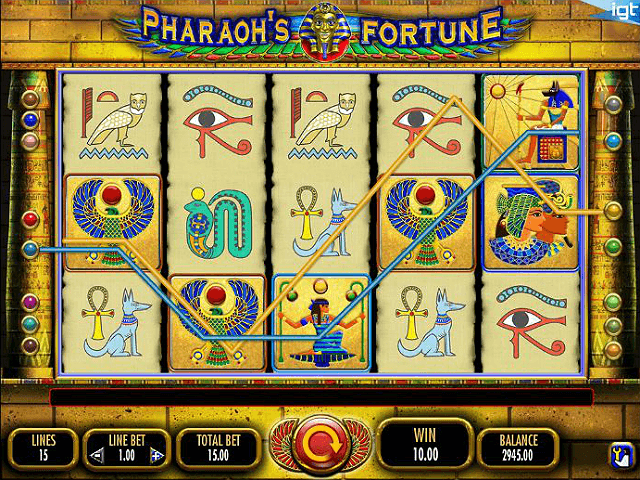 If you like Pharaoh's Fortune, you'll love these slot titles too!